Hello lovelies! Today I have another Born Pretty Store review. If you missed my last one back in February, you can find my post here. 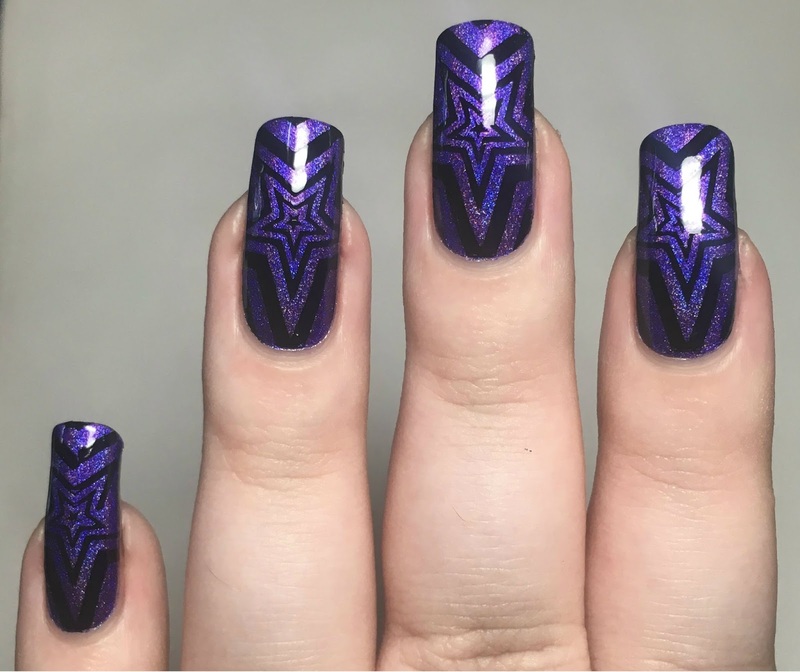 I was kindly sent another one of their holographic polishes along with one of the new stamping plates. I absolutely love both items, and used them together to create the mani below. Read on for more info! 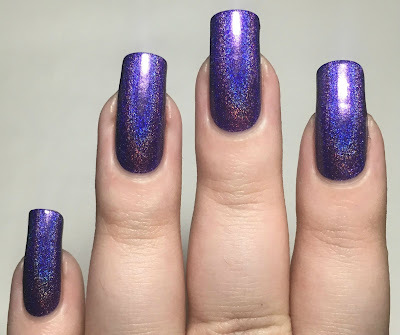 'Temptation Wait' (item #35781, online here) is a rich purple linear holographic. The formula is very smooth and easy to apply, and it is fully opaque in just one coat. There's no denying that this is a one coater - I didn't apply it at all thickly or carefully. I also added a second coat on my thumb to see if it deepened the colour and it made no visible difference. Below is one coat without topcoat. Before I get into the stamping, here's a quick look at the plate itself - Kaleidoscope BPX-L021 (item #38744, online here). It has a lovely selection of patterns, all big enough for longer nails. The star optical illusion/cyclone pattern on the bottom right of the plate was the first to catch my eye. I stamped it over each of my nails in black, using my Born Pretty clear stamper and scraper to make placement easier. I finished with a coat of topcoat. What do you think? I really like them! 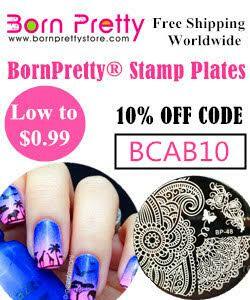 The images on the stamping plate are the perfect size for my longer nails, but would still work just as well for shorter nails. 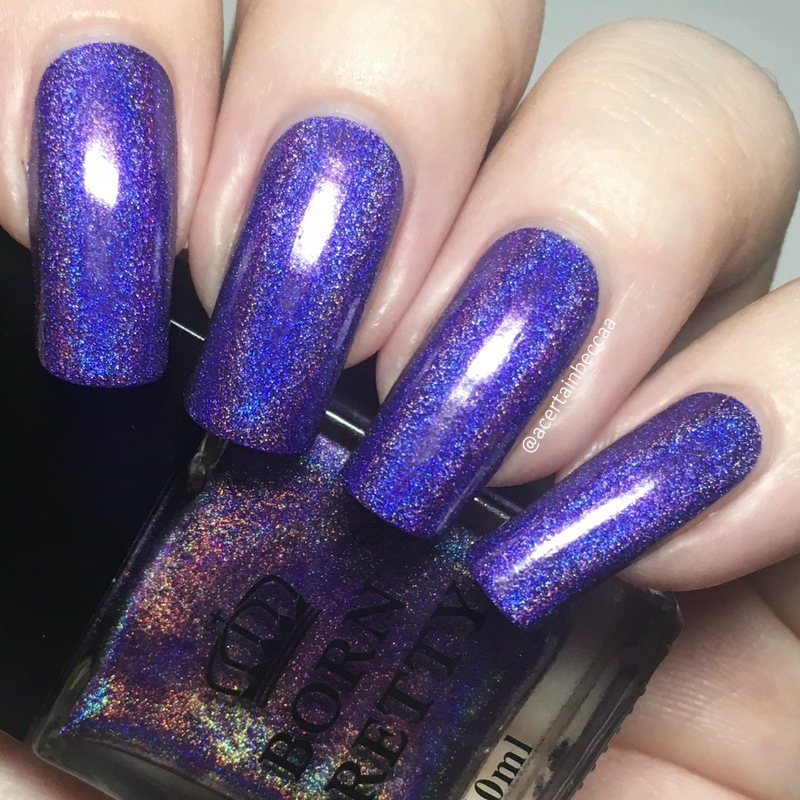 I'm also yet to find a Born Pretty holographic that doesn't have a beautiful formula, and the holographic is so intense - they all look amazing in the sun. You can find both items mentioned, aswell as hundreds of others on the Born Pretty Store website here. You can use my code BCAB10 for 10% off your order. Super cute! That plate looks like it has some great images for nail art! You had me at purple! :) Gorgeous polish & the plate has some great designs on it. 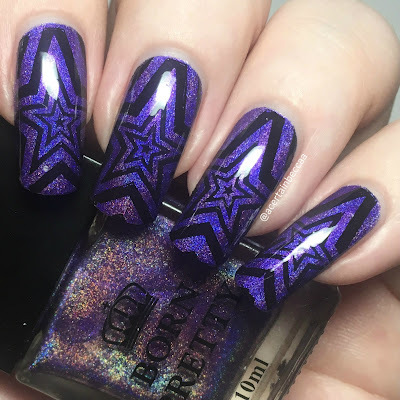 The star image you selected looks amazing on your nails! This is a really beautiful plate. Some day I'll order from them...there's just so many choices, I'm not sure I can pair it down to a reasonable amount. That is so cool. It has a great seventies vibe. This purple is so intense. Your stamping is perfect! Wow, that holo looks incredible! I really need to get my hands on some more of their polishes. This is GORGEOUS with the stamping! i want....no NEED this color!! Absolutely gorgeous!!! The base color is so pretty though! I've only purchased from the Born Pretty store once, but besides taking a little while to deliver I had a fantastic experience. And the products were good quality, especially considering the affordable prices!